Hello and welcome everyone to another edition of Graps and Claps, this time taking me on the monthly jaunt to Hindley for Grand Pro Wrestling and their ‘Friday Night Thriller’ show with the Main Event for the GPW Heavyweight Championship between the Champion Joey Hayes and Liverpool’s No.1 Zack Gibson. Arriving in Hindley for 6 p.m we made our way to The Hare & Hounds to meet up with GPW regulars Ben & Tom for a pint in what many people call an ‘Old man’s’ pub and that description is very apt as it feels like that local village pub where you get the same people visiting every night – reminiscent of the comedy – Early Doors, also add in a couple of doggo’s traipsing around wanting to be stroked this is very much a homely pub to visit when in Hindley. In this pub I had a £2.70 4.5% pint of Chocolate & Vanilla Moose Stout (Purple Moose Brewery) which was a bob on pint – so thumbs up all around for this place. Last pub before going to The Monaco Ballroom was The Hindley Arms which is maybe the most aesthetically pleasing pub in Hindley, but one where you can think when it gets packed on a weekend, fights would happen all over the shop. Only the 1 pint in here which was a £2.50 pint of Black Edge Brewery Porter that was fine but not of the quality of the previous pint in The Hare & Hounds. Bare in mind for tonight that the winner’s of all the matches except for the last two would get an opportunity at the Crazy Cruiser 8 tournament on the 30th November. First up we had a Tag Team title match with the new Champions, The Austins (L.A & Lana) taking on two members of The House of Isaiah in the form of Nate Travis & Nick Maguire who were also accompanied by Jacob North and Matthew Brooks still in capture under a hood. Early opening of this match was The House both dominating L.A, L.A did manage to hit a meteora in between but was soon stifled in his attack, once L.A managed to make a comeback he made the hot tag to Lana who came in and cleaned house hit a double team sidekick in the corner to Maguire. Jacob North tried to get involved but he was thwarted by Brooks who stopped him from interfering, this led to the finish of Maguire being hit with a Tilt-a-Whirl stunner from Lana to get the victory for The Austins in what was more of a showcase for The Austins. After the match, Matthew Brooks whilst celebrating his release from The House was then low-blowed once again from behind by Isaiah Quinn, which in turn Quinn then went down to the ring to remonstrate with his minions, in which he turned on Nate Travis and dismissed him from The House of Isaiah. Next up was a Grudge Match set up from Ste ‘Bin’ Mann turning on long-time partner Jett Fashion. The bulk of this match was dominated by Mann who continuously laid in the boots to his former friend but it was a case of Mann getting too cocky for his own liking as he was caught with a CHEEKY ROLL-UP by Fashion for the 3 count, this for me was an indication that this feud will continue on to another match, as for the Grudge Match stipulation this fell a bit flat on this occasion compared to other blood feuds in GPW so hopefully they will have something better in the bag for next time (Maybe a Dumpster match?). Third match was a four-way match where 3 people would qualify for the Crazy Cruiser 8 and 1 wrestler would be eliminated if they got pinned, so it was very much a case of must not lose in this match. Your 4 competitors for this contest were as follows – ‘Jumpin’ Jimmy Jackson, Jack Griffiths, Soner Dursun and Isaiah Quinn who was greeted with chants about his Purple Pants and also a Purple Pants sign from one GPW follower which was immediately ripped up by Quinn. This for me was the best match of the opening half, with I would say Griffiths looking impressive in the process and is maybe one wrestler who could surprise in the Crazy Cruiser 8 tournament. Finish of this match came when Quinn hit a top suplex to Griffiths, which was followed up by Durson hitting a huge frog splash to Jimmy Jackson to get the 3 count to advance with Quinn and Griffiths and send poor Jimmy Jackson packing out of a Crazy Cruiser opportunity. 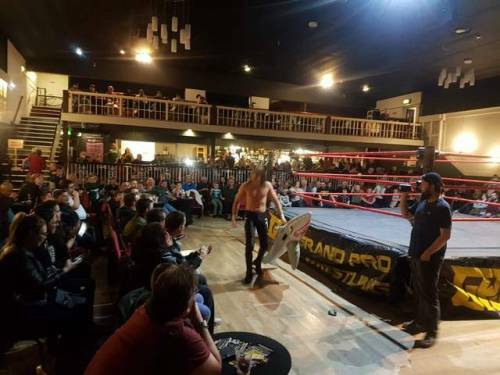 Back from the break we returned with GPW Owner Johnnie Brannigan coming out to address the status of the GPW British Title which is currently held by an injured Sam Gradwell. Brannigan in a decision what must have been hard for him, stripped Gradwell of the title as Sam is out of action for somewhere of up to 12 months which is a big hit to the GPW shows as Gradwell has been one of the stars of the show, but as ever this is an opportunity for someone to step up and take Gradwell’s lofty perch. 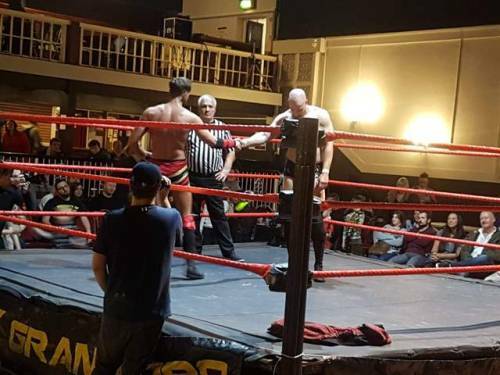 Brannigan after this announcement, then announced that there would be a British Title tournament starting in January 2019 and he then announced four of the competitors in the tourney – Mickey Barnes, Kameron Solas, Chase Alexander and Rizzy Khan. Out came Sam Gradwell, who wasn’t happy with him being stripped of the title but he promised that there would be a ‘Second Coming’ like some Hindley Jesus figure and he would once again become the GPW British Champion once again. After his speech though, Gradwell indicated that the 4 lads in the ring weren’t there to aid Johnnie, they were there to lay the boots in on poor Johnnie which they duly did. 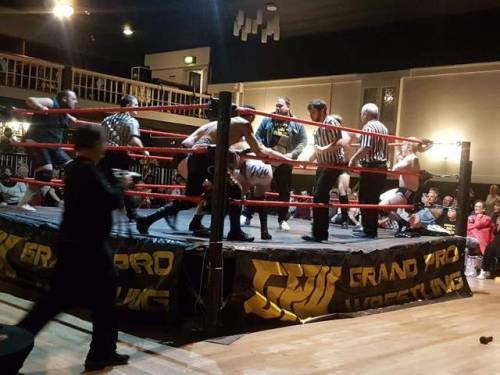 Cue the whole locker room emptying including Si Valour, Tu Byt, Rio, Drill and The Young Guns to brawl all around the ringside area – this was certainly a chaotic scene. The last Crazy Cruiser 8 qualifier was next with Martin Kirby taking on Sandy Beach (Inflatable shark and ‘Sandy Shark’ chants in tow) in a highly anticipated contest for those in attendance. This was a fascinating match as Beach initially was playing the bad guy to Kirby’s good guy shtick but in among the adulation for Beach the roles got reversed and this turned into a great bout (Props to both guys for reading the crowd right here, which you don’t see enough of in British Wrestling). Kirby when in control hit a Michinoku Driver to Beach for a two count, Kirby did call for a Sable Bomb but this was reversed by Sandy who got the roll-up victory on Kirby to advance to the Crazy Cruiser 8 Tournament, all that was left for Kirby was the AAAAAAAARRGGGGHHHHH Finger Point of Doom to send him to the back. With Sandy Beach, it is amazing the turnaround in the crowd’s reaction to him from someone you wanted to see get beat when he would make unwelcome appearances for open challenges, but along the way he has proven what a fantastic talent he is with great performances against El Ligero, Damon Leigh, The Rumble performance and also this match against Martin Kirby. Also take into account the Inflatable Shark japes with the ‘Baby Shark’ inspired chant which has got him over with the kids in the audience in such a magical turn of events – trust me when I say that Callum Corrie/Sandy Beach is certainly a star in the making. Next up we had a ‘Open Challenge’ Tag Match with the former Tag Champions – T-Bone & Craig Kollins offering out two willing victims in the back for the evening which turned out to be Stoxx and J.J Webb who were both in for the beating of a lifetime. This was comparable to one of them 1990s Road Warrior squash matches where the victims never got a chance as Kollins and Bone hit suplexes and lariats to both Stoxx & Webb and then duly finishing them off with a Double Mass Murder Splash for the win to put them back in contention for another tilt at the GPW Tag Team Titles. Main Event time now for the GPW Heavyweight Championship with Zack Gibson taking on Joey Hayes. As ever Gibson was being booed mercifully by the Hindley crowd as he started his promo about looking up to Joey and nicking some of his moves in the process and also a great line of being a wrestler in GPW and not wanting to miss the last train back, but then telling Joey not to worry as this match wouldn’t last too long. Before we get into the match, it has to be mentioned that Gibson’s WWE music is the absolute drizzling shits – devoid of any musical hooks or anything of that ilk (bring back You’ll Never Walk Alone). Another stellar match up in this second half in a back and forth contest where Gibson was well on his way to victory hitting a Helter Skelter for a close two fall. Joey had Gibson at one point in the Cross Hayes but Gibson managed to reach the ropes with his feet to break up the move, but it was another Cross Hayes in the centre of the ring which would prove Gibson’s undoing as he tapped out to Joey in around 20 minutes to bring an end to proceedings at 10pm with a handshake to Hayes. This was really a show of two halves with the second half proving the better of the two with storyline development between Brannigan and Gradwell plus two killer matches with Kirby/Beach & Hayes/Gibson which would stand out anywhere in the country. GPW are back for there last show of 2018 with the Crazy Cruiser 8 on the 30th November – check the website for ticket details. Time to set up back up the road to the train station but not before a visit to The Edington Arms for a pint, a game of pool and me murdering a Britney Spears classic “Hit Me Baby One More Time”, go and check @britwresawaydays on twitter for the full video (cover your ears – you have been warned!). 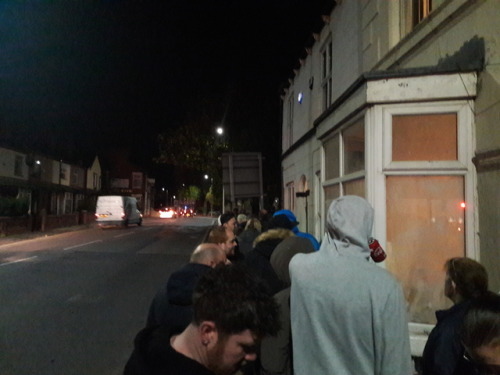 I hope you have enjoyed reading this review and any comments/feedback are welcome, I will be back on The Indy Corner on Monday with a review of Progress Wrestling’s show in Camden for the Main Event of Walter vs Zack Sabre Jr for the Progress World Title, so until then – BYE! !